Findings: Chest radiographs show bilateral air-space infiltrates in both upper lobes (A and B, arrows). There is widening of the right superior mediastinum (A, asterisk), displacing the right wall of the trachea. Moderate scoliosis. Three weeks after treatment the infiltrates have healed. Widening of the upper right mediastinum persists. The clue to the diagnosis lies in in the absence of the aortic knob on the left, placing the aortic arch on the right side (C, white arrow) and simulating a mediastinal mass. Due to the scoliosis, the pulmonary arch is more evident and simulates a low-lying aortic knob (C, red arrow). Unenhanced coronal CT (D) confirms the findings (A aorta, P pulmonary artery). I am presenting this case to discuss the importance of negative findings. In radiology teaching we stress the importance of positive findings, such as increased opacity of the lung, pulmonary nodules, etc. However, we may fail to note absence of a structure that should be present. Recognizing this absence may be vital to reach a correct diagnosis (Fig. 1). Fig. 1. PA radiographs of two different patients with a rib abnormality. 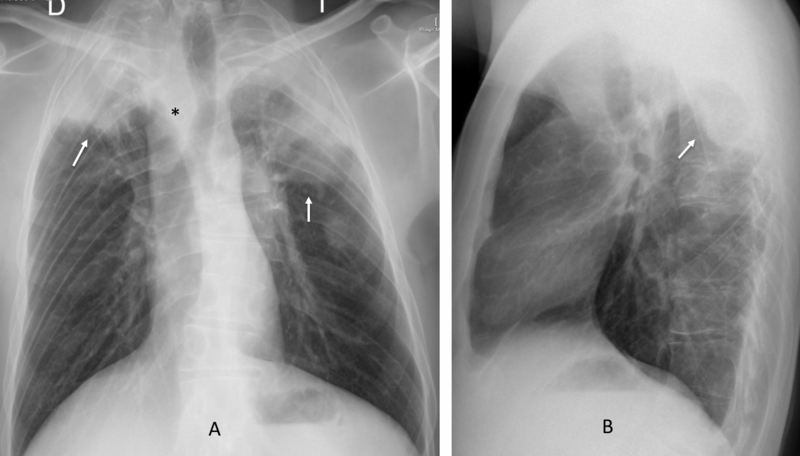 In the first one (A) it is easy to detect the increased opacity of the right 5th rib due to Paget disease. 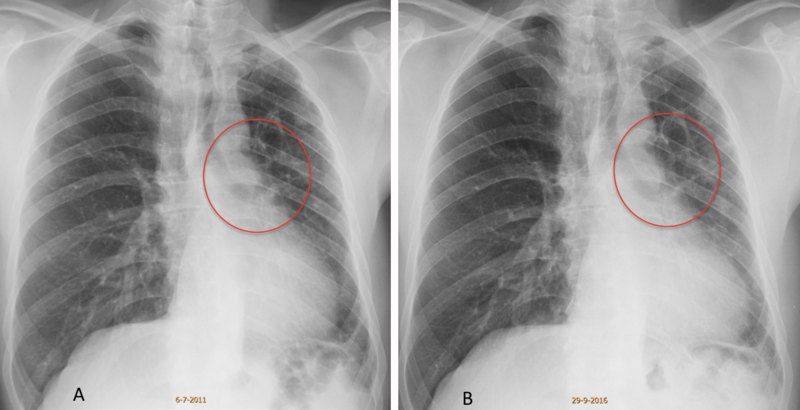 In the other patient it is more difficult to detect the widening of the second intercostal space and the apparent absence of the proximal 3rd rib (B, circle). The widening of the space and absence of the proximal 3rd rib (C, arrow) are better seen in the cone down view. Review of a chest radiograph taken during infancy shows congenital fusion of the 3rd and 4th ribs (D, arrow) accounting for the findings. Sherlock Holmes was clever enough to detect a negative finding. The fact that the dog did not bark indicated that it knew the murderer and, based in this clue, Holmes solved the case. We radiologists should pay special attention to similar negative findings that may help solve our cases. There are two causes for absent anatomic structures: congenital malformation or previous surgery. Congenital abnormalities are not rare in adults. 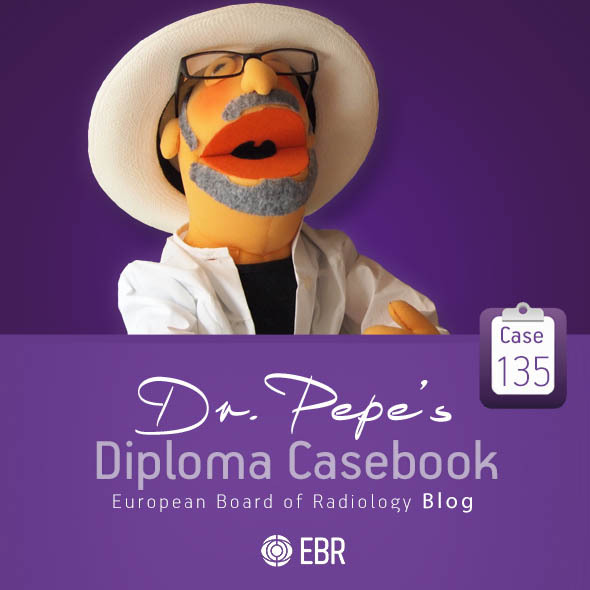 In some cases, a structure is missing and this fact may be overlooked, especially in routine examinations. This occurred in the following patient (Fig. 2), who had yearly check-ups for five years. The chest features were reported as unchanged until 2016, when the radiologist discovered that the left hilum was absent. Fig. 2. 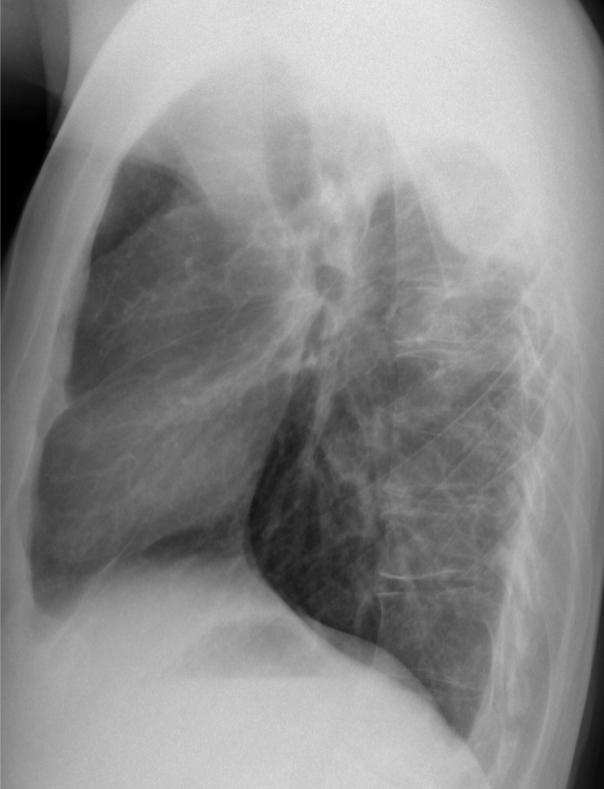 Routine check-up chest radiograph in an asymptomatic 44-year-old man (A) was reported as showing chronic changes in the left lung. In further yearly check-ups, the features were reported as unchanged until 2016, when the radiologist discovered that the left hilum was missing (A and B, circles) and requested a CT. Enhanced coronal and axial CT images show that the left pulmonary artery is absent (C and D, yellow arrows). Collateral circulation from bronchial arteries is visible (B, red arrow). Diagnosis: congenital absence of left pulmonary artery. Previous surgery is the most common cause of a missing anatomic structure. Detecting this finding may be important for the radiologic diagnosis, as demonstrated by the cases below (Figs. 3 and 4). Fig. 3. 47-year-old woman with back pain. Lateral radiographs shows an ivory vertebra (B, circle). The differential diagnosis is Paget disease, metastasis, or lymphoma. The diagnosis of metastasis is evident after noting the absent left breast in the PA film (A). Sagittal CT of the spine shows several sclerotic metastases. Previous mastectomy for carcinoma. Fig. 4. 45-year-old man with acute chest pain. 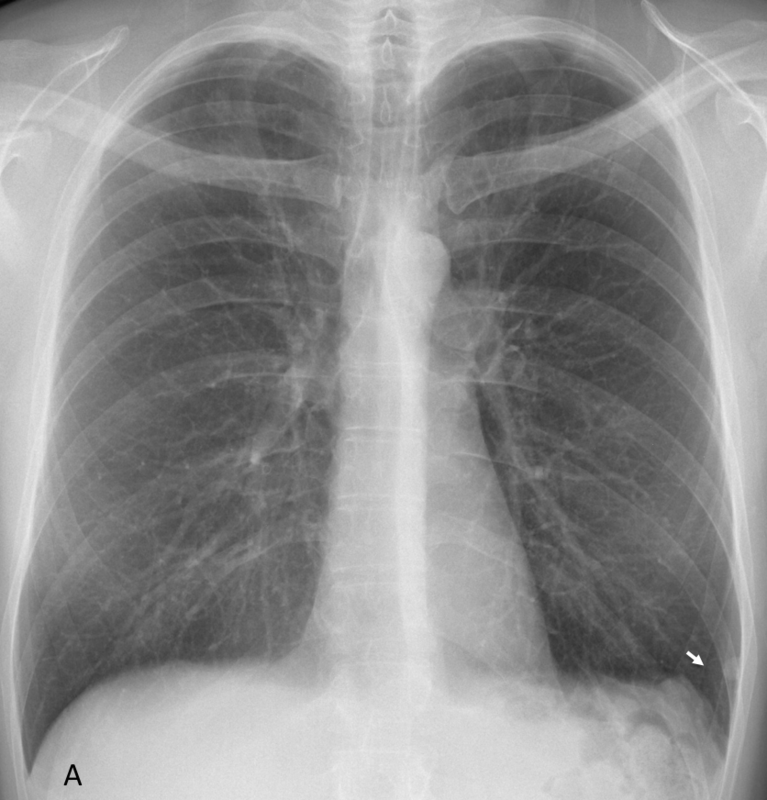 PA chest radiograph shows irregularity of the left hemidiaphragm and a small peripheral nodule (A, arrow). Enhanced coronal and axial CT show several nodules in the LLL (B and C, arrows). The diagnosis is evident after discovering the absent spleen, which suggests splenosis as the origin of the nodules. The diagnosis is confirmed with labelled erythrocytes, which show several accessory spleens (D, arrows). The patient’s spleen had been removed after a car accident. Sometimes, anatomic structures are not seen because they are not in their normal location. A common example is right-sided aortic arch, which can simulate a mediastinal mass unless we note that the aortic knob is absent on the left side (Fig. 5). Fig. 5. 35-year-old woman with right aortic arch (A, arrow). A mediastinal mass can be excluded because there is no aortic knob on the left (A, asterisk). Enhanced coronal CT confirms the diagnosis of right arch with an aberrant subclavian artery (B, white arrow). The small nodule under the arch is the azygos vein (A and B, red arrows). The same occurs with the gastric bubble, which is visible in 90% of patients. Occasionally, it is not seen because the abdominal organs are inverted and the stomach lies under the right hemidiaphragm (Fig. 6) (See Caceres’ Corner, cases 178 and case 194). Fig. 6. 45-year-old man, asymptomatic. PA chest radiograph shows the gastric bubble under the right hemidiaphragm (A, black arrow) and a prominent azygos arch (A, red arrow). The findings are characteristic of levocardia with abdominal malrotation. Axial CT in a similar patient shows the inverted stomach (S) and liver ( L). There is polysplenia (B, circle), typical of this malformation. Anatomic structures may not be seen because they are hidden. The best example is provided by the pulmonary hila, which hide behind the cardiac shadow when displaced downwards by lower lobe collapse (Figs. 7 and 8). Fig. 7. 62-year-old man. Preoperative chest film for hip surgery. The left hilum is hidden behind the cardiac shadow (A, arrow) due to LLL collapse. 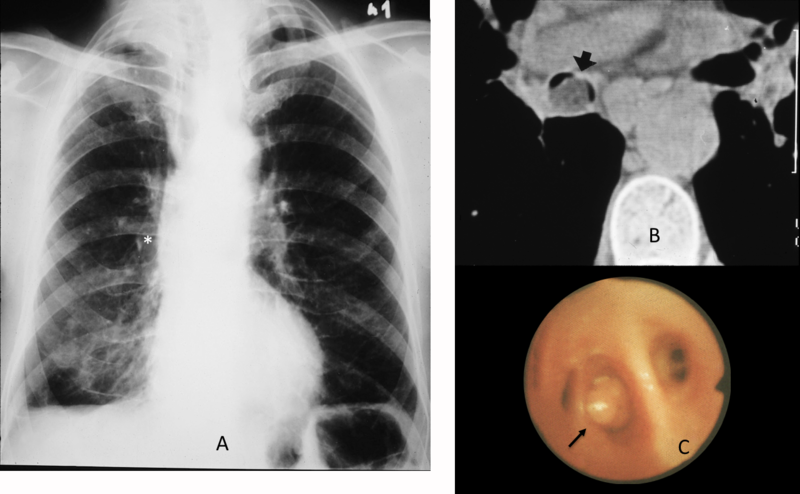 Other signs of collapse are increased lucency of LUL and a concave line which corresponds to the left major fissure (A, red arrow) Coronal CT shows irregularity of LLL bronchus (B, arrow). Diagnosis: carcinoma. Fig. 8. 68-year-old man with chronic cough. 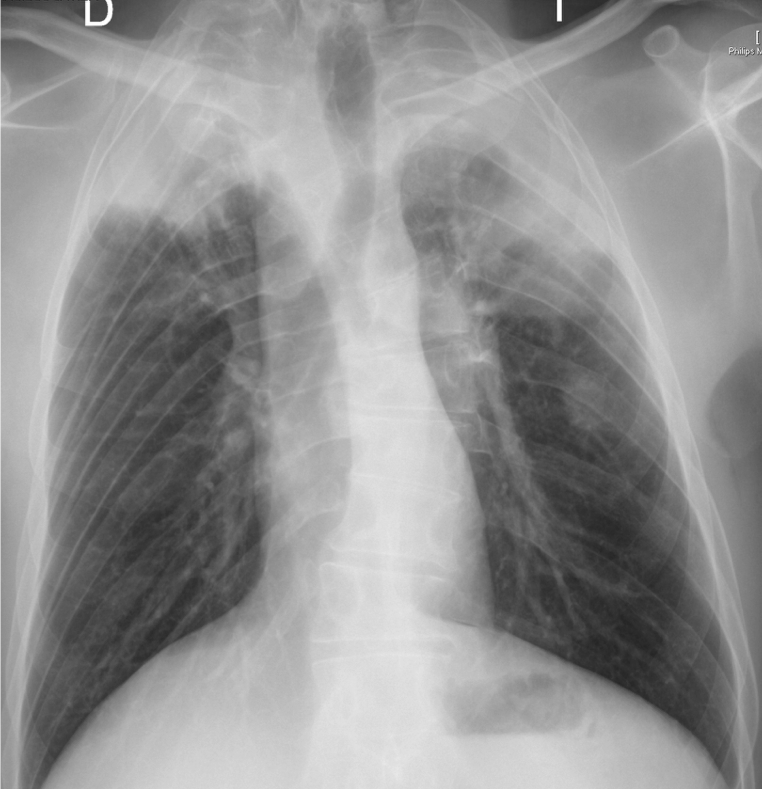 PA chest radiograph shows an absent right hilum, (A, asterisk) which is hidden behind the heart due to RLL collapse. 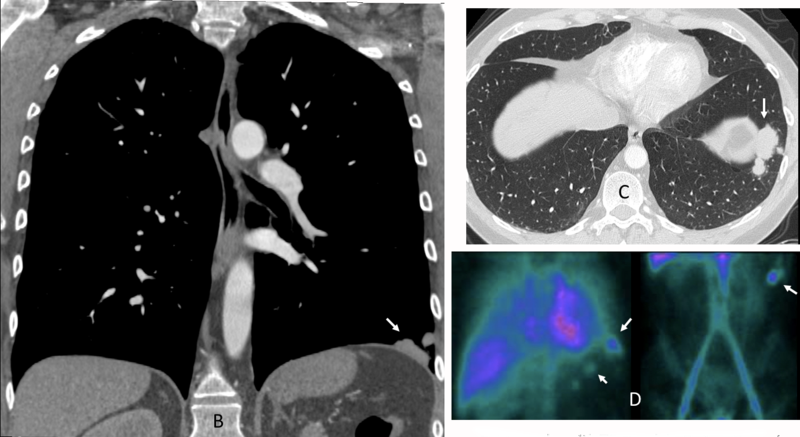 Axial CT depicts a fatty mass within the intermediate bronchus (B, arrow) that is confirmed with bronchoscopy (C, arrow). Diagnosis: endobronchial lipoma. Difficult one, at least for me. – left hilium might be big and dense with doughnut on the side, but I’m not sure if that’s not due to scoliosis. My main ddx here (in the setting of fever) is peripheral pneumonia with probable underlying proximal mass or some kind of inflamation in upper mediastinum (Zenker’s diverticulum? esophagitis? foreign body in esophagus?) with bilateral apical loculated fluid/abscess. But I really don’t know and he would go straight to CT.
Nice discussion. I think the left hilum is prominent because of scoliosis. Don’t see the doughnut on the lateral view. Chest wall deformity is noted (scoliosis, right-sided ribs are crowded). There appears to be bilateral upper lobe volume loss and bilateral apical dense opacities with no visible vascular markings and indistinct lower borders, associated with traction of both hila upwards and slight displacement of the trachea. There is inhomogenous consolidation with possible cavitation adjacent to the dense opacity on the left, and a round relatively ill-defined nodule below. The left hilum is widened and denser than the right. DDx would include reactivation TB, previous TB and current atypical infection (fungal? ); cannot exclude underlying malignancy. Perhaps unlikely, but since apical opacities seem to have a pleural component, a background of pleuroparenchymal fibroelastosis is possible. CT would be necessary to clarify the apical opacities, check for cavitation in the consolidation and better visualize the nodule. Another small opacity seen in the left middle lung zone. There is mass effect on the right lateral trachea wall. An ill-defined area of increased density in the right upper lobe without volume loss. A pleural based opacity projecting into the left upper zone, probably consistent with loculated pleural effusion. A round opacity clearly appreciable only on the frontal radiograph, projecting into the left middle zone. Both the infectious and the neoplastic theories should be considered, and I would request a CT examination. There’s also mild thoracic left convex scoliosis. Widening of the superior mediastinum with anterior displacement of the trachea. nodule that I couln’t see clearly on the lat view. another small round opacity left mid zone. ?overlying spine on lat view. cannot make out if any rib destruction right at costvertebral junctions. I see bilateral upper lobe consolidation with loss of volume, thinking in a differential between TB, pneumoconiosis, sarcoidosis, lymphoma and pleuroparenchymal fibroelastosis. Moreover I see two nodular opacities: one extrapulmonary in left upper lobe and the other one intrapulmonary in apical segment of left lower lobe; and widening of mediastinum. Maybe I’d go first with lymphoma… But I’d recommend a CT exam. You are leaving out pneumonia in your differential. remember that the patient has high fever. The answer is acute infection. The point of this case is discovering a right mediastinal mass pushing the right tracheal wall. The aim is to discuss negative findings, a concept that is not well known. Congratulations to Ner and Ahmed, who were the first to discover the mediastinal alteration.